Calcium carbonate is a common, naturally occurring calcium salt that is often used as a source of calcium in supplements. Its abundance in nature makes calcium carbonate the least expensive supplemental calcium salt. It is also a major component of some types of stone that are used in architecture and sculpture. Calcium is a metallic element, but it is not found in its elemental form in nature due to its reactivity, explains Dr. Martin Silberberg in his book, "Chemistry: The Molecular Nature of Matter and Change." Calcium tends to react with other elements, producing compounds called ionic salts that consist of positively charged particles of calcium and negatively charged particles of varying identity. In the case of calcium carbonate, the negative particles are carbonate, with the chemical formula CO3. Calcium carbonate is abundant in nature. 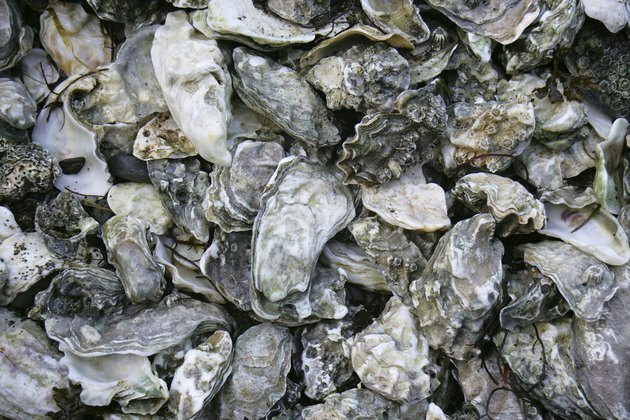 The most commonly used source of calcium carbonate for supplements is oyster shells. Although many salts dissolve in water, calcium carbonate does so only to a very insignificant degree, which is why shells of aquatic creatures do not dissolve. In an acidic solution, calcium carbonate dissolves readily; calcium carbonate supplements can provide calcium to the body because stomach acids dissolve it easily. Calcium carbonate is a major component of marble, limestone and the skeleton of coral. You may have heard that calcium carbonate supplementation is inexpensive but that it is not a high-quality source of the mineral because it does not always dissolve in your stomach. Generally speaking, this is untrue, explains dietician Deborah Straub in a 2007 article in "Nutrition in Clinical Practice." Unless you are taking acid blockers or acid reducers for ulcers or reflux, you produce sufficient stomach acid to utilize calcium carbonate as a source of calcium supplementation. The abundance of calcium carbonate in nature becomes important in light of the increasing acidity of rainfall and oceans in response to burning of fossil fuels. Acid rain, produced when emissions from fuel burning combine with water in the atmosphere, dissolves limestone and marble structures and artwork and acidifies rivers, lakes and ocean water. In turn, this causes aquatic shells to weaken and begin to dissolve, with major ramifications upon ecosystems.